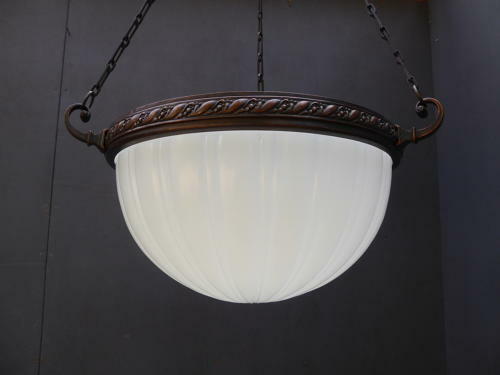 A beautiful large antique moonstone glass plafonnier. A beautiful & elegant piece, the heavy fluted opaque glass shade supported by its copper gallery with rope twist detailing & 'box' hanging chains, all with a wonderful untouched patina. The moonstone shade boasts a robust nature yet delicate appearance & emits a beautiful, even & unrivalled glow once lit. Perfect for the larger space & not often found in this size. The light comes ready to install with original hanging chains & a brass bulb holder with a generous length of twisted flex. It will require a ceiling rose to hang. Wear commensurate with age, all original with the shade & hardware both in excellent condition. The light currently has a drop of around 75cm & including the chains though the chains could easily be shortened. The light including the gallery is 41cm across, the glass alone measures 35.5cm across & the light excluding the chains is 22cm deep.